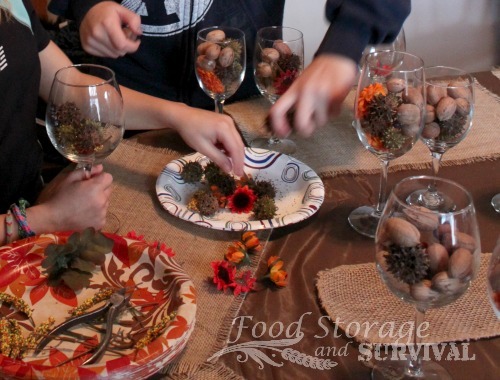 Want a table centerpiece that is easy to make and still looks fabulous? 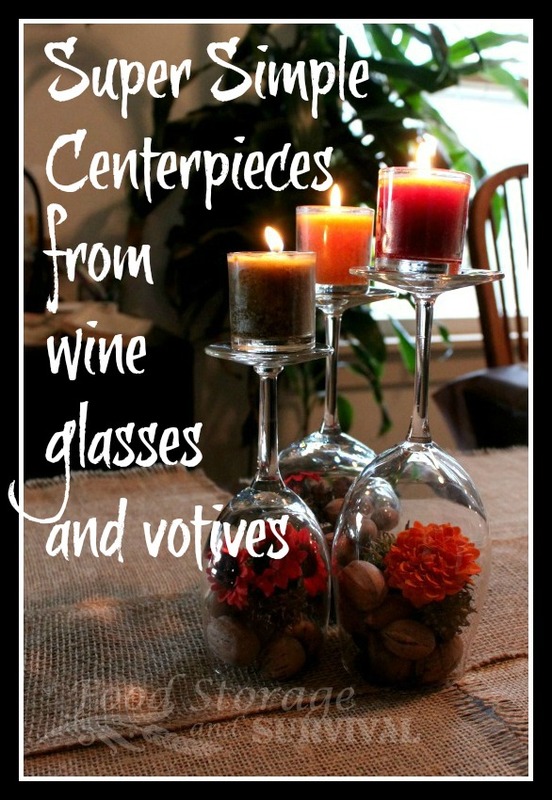 These inverted wine glass centerpieces are super simple (even the kids or us non-crafty folk can make them), very inexpensive (a lot of the supplies you probably have on hand or could forage), and so classy! Wine glasses or other clear goblets of varying sizes. Groups of three look nice. You may be able to find these at a thrift store if you don’t have any at your house. Small votive candles. In jars is best to keep your glasses from getting all waxy. Choose colored candles to match your event decor. Real and fake flowers, nuts, and other decorations. Let your imagination work here. 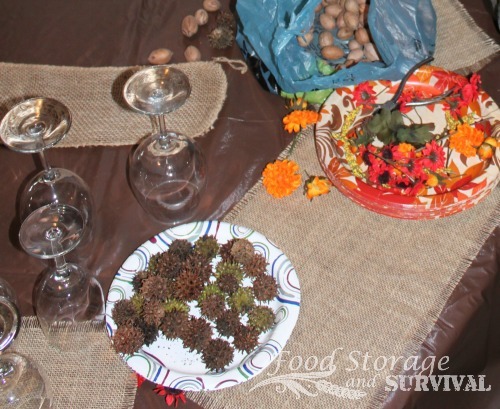 We used fake flowers, pecans, and seed pods from a gum tree. We were decorating for Thanksgiving. Small Christmas ornaments would look nice with pine cones for a Christmas party or whatever else you dream up. Place the decorative items in the wine glass in the opposite order you want it to appear when it’s finished. If you want a flower on top, put it in first. Fill it about 2/3 full. It doesn’t need to be completely filled–a little space looks nice. Repeat for the rest of the glasses. Make sure the rest of the table is ready, because once you flip these over you don’t want to have to move them again. Place one hand over the glass and turn the whole thing over. Place the glass where you want it on the table and slide the glass off your hand and onto the table. Quick, like the magician guy who pulls the tablecloth out from under the dishes. Add candles to what is now the top of the glass, and voila! 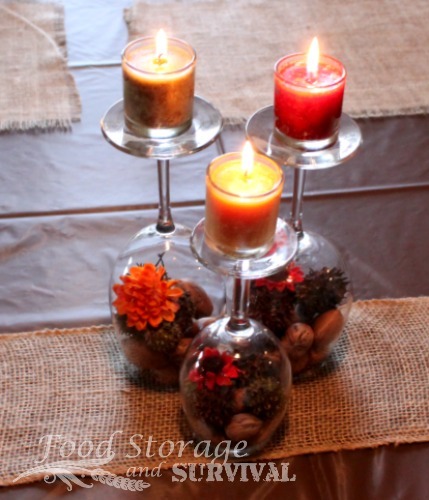 Easy, cheap, beautiful, centerpieces. If you have candles in your emergency preparedness supplies, these could be put together without a trip to the store!